One thing I get asked about all the time is how I curl my hair! 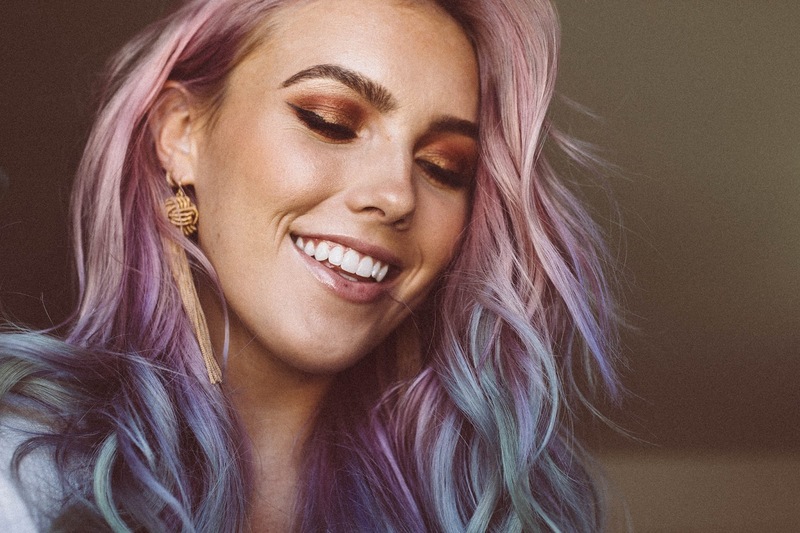 I'm stoked to have teamed up with Bombshell Extensions to share my Everyday Hair Tutorial with you guys. As most of you know, I've worn Bombshell Extensions for the past 3 years and s w e a r by these extensions. They are by far the highest quality extensions I've ever worn and the have so much more hair than any other extension brand I've ever tried. And trust me, I've tried A LOT of extensions. Currently I wear the 18 inch tape in extensions in the color #22 and I get them custom colored by @hairbymandielynn and she's amazing!! I maintain the color in between appointments (I'll do a tutorial on that next) so it all works out great! For the hair color I currently hair I use Arctic Fox hair dye. I use the colors Virgin Pink, Girls Night, Periwinkle and Neverland. I only dilute the Virgin Pink and let all the other colors do their thing! I normally use Arctic Fox's diluter to dilute the Virgin Pink but when I run out of that I just use white conditioner from the drug store. Anyways, let me know if you guys have any questions, this tutorial is fairly self explanatory! I hope you guys enjoy it and please do let me know what you'd like to see next!